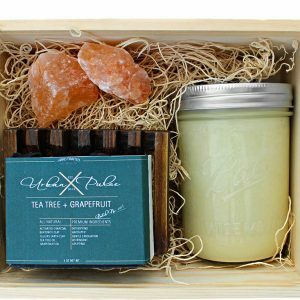 Create a sacred space to relax with our curated Peace and Clarity Set. Smudge sticks are hand wrapped to promote love, light and positive vibes. Smudging is a ritual valued for purifying your space and aura by burning the herbs and dispersing the smoke around your space. Each is unique and beautiful made with a variety of Eucalyptus, Lavender, Pine, Rosemary and Rose Petals. Spreading tranquility and good health while removing negative vibrations. 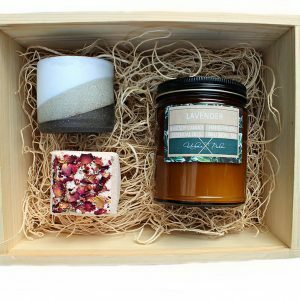 This set also includes a bath soak, essential oil candle and bath bomb to ensure the relaxing night you’ve been dreaming of. Light the candle and grab a glass of your favorite wine. Then hop in a warm tub with your new soak and bath bomb. Enjoy! Witch hazel has the ability to fight acne, reduce inflammation and provide nourishment. Smudge sticks cleanse your space and purify your spirit by removing negative vibes and allow room for positivity. Aloe vera fights against future acne breakouts and soothes damaged skin. Oatmeal is powerful at relieving dryness, inflammation and irritation. Packed with comforting qualities safe for even the most sensitive skin. Coconut milk is incredibly soothing and rich in amino acids to deeply moisturize skin. 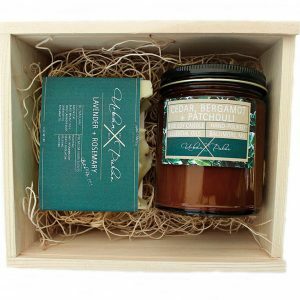 Gift Sets Includes: (1) 4 oz soy wax candle of your choosing, (1) 8 oz Coconut Milk Bath Soak, (1) bath fizzy of your choosing and (1) Sage Smudge Stick in a wooden gift box with detailed product descriptions. Candle Burn Time: Approx. 25 hrs.